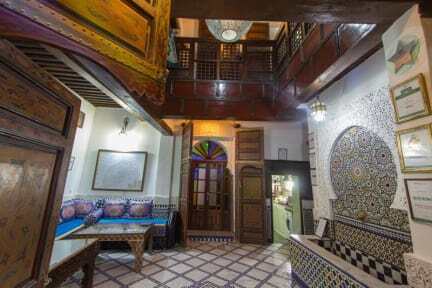 Dar El Yasmine is a beautifully renovated 17th Century home that once belonged to a wealthy traders family residing in Fez, the ancient intellectual and spiritual capital of Morocco. Dar El Yasmine has recently changed hands once again, and we look forward to welcoming our guests into Fassi and saharian life with the same hospitality Morocco is famous for. 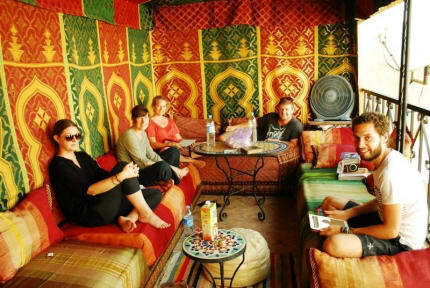 dar el yasmine organize the excursion of fes (meknes,volubilis,safrou,azrou,ifran...)and to sahara desert where the owners from. Tout est super, un bon androit pour visiter les alentours avec un bon petit déjeuner pour bien commencer les journées, belle terasse, et les gens de l’hotel donnent de bons conseils. Super séjour !! Great hostel! The private room was amazing especially with AC. The service was impecable. The free breakfast was totally worth it, losts of choices. And the hostel was a few steps from the blue door and the rest of the medina. Great experience overall !!!! Super, une tres bonne adresse. Dommage que cela soit mal isolé et quon entende pas mal les bruits de la rue. Sinon une des meilleurs adresses que j'ai fait! Reservation made at Yasmine, they take you to some other place near by.